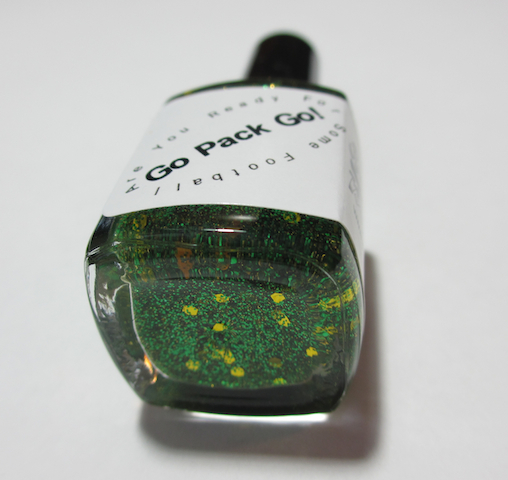 This is BadAss Polish - "Go Pack Go." This is the second glitter polish I am reviewing in the BadAss Polish "Are You Ready for Some Football" Collection. As with the Dallas Cowboy's inspired polish yesterday, the amount of glitter is amazing. This is one coat and you can see how much glitter you get. The yellow pieces are very abundant and there was no problem getting a few on each nail. I'm excited for the Packers fans. 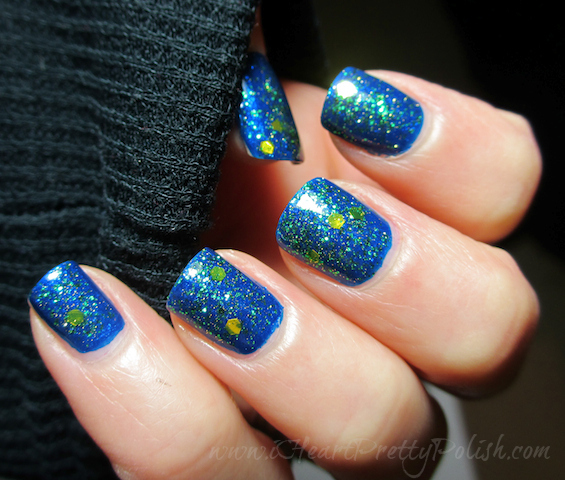 This would be a great polish to wear to show your team spirit! Here is the packaging. As I said on my last review, it comes in this heavy-duty tube and includes a piece of felt for easy glitter polish removal. Just add your nail polish remover to the felt and it seems to grab the glitters and removes them with ease. Does every team have a huge rival? Is it usually the state next door? Which state are you from and who is your football rival? Note: This polish was sent to me for review. These are my honest opinions - as always. Lolol, way to keep it on the dl ;) It looks really good over blue. No NFL teams in Oregon, but we do have a pretty major college rivalry (Oregon vs. Oregon State). Wow, what a difference. Are you liking Arizona? I bet the weather is nice there right now. Well, the Twins aren't in our division. We have the Milwaukee Brewers and I am a huge fan! I will definitely be making a polish for that! I think we still hate the Vikings....just not as much as the Bears! When we go "up north" to like Eagle River area...it seems as if there are more people who are anti-Vikings so IDK! I have a good friend who went to college up there and stayed there so that would kind of make sense. Oh, this looks interesting over blue! o.o Don't really likeit in the bottle, but I'm loving that combo you did. Great color combination! Sadly our football team is the Cardinals. No one is scared enough of them to be a rival. As a Bears fan, I could barely bring myself to look at a mani with Packer's colors. LOL. JK. Seriously, people, give Chicago a shout out! Bring on the orange and blue!! 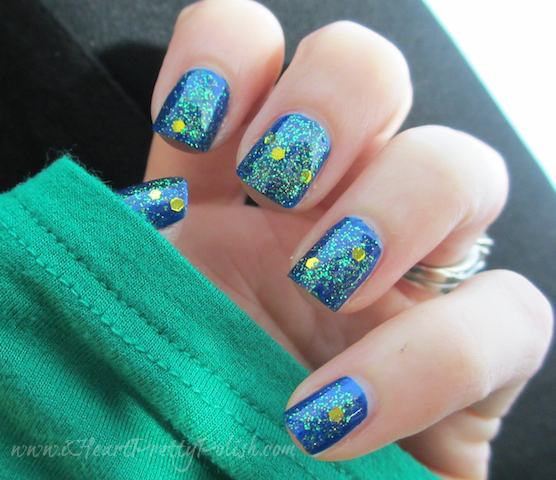 I love Green Bay colors and they were actually my college colors too :) I like that you chose a blue base for this mani!